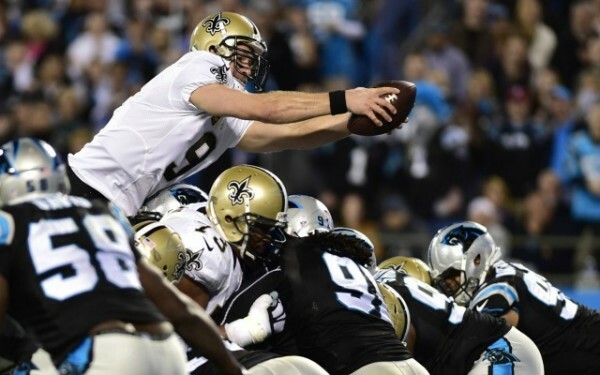 The New Orleans Saints weren’t playing in a dome, but they still got a very good performance from Drew Brees in a 28-10 win over the Carolina Panthers which changes the lead in the NFC South, while Cam Newton continues to look like a quarterback that’s actually going through a regression, putting on his worst game of the season. Brees wasn’t perfect, but he completed a touchdown pass to Jimmy Graham and completed 24-of-34 passes for 297 yards while running for a touchdown as well. He threw on pass that was intercepted but compared with the other quarterback, it was an excellent performance. When Cam Newton overthrows his receivers one by one, even someone as tall as Kelvin Benjamin, anyone looks good in comparison. The Panthers got only 231 yards of offense as Newton completed just 10-of-28 passes for 151 yards, throwing one interception. He was sacked four times although the Saints didn’t use too much extra pressure. They recorded a 20% sack rate on Newton’s dropbacks with four or fewer pass rushers compared to their usual rate of 4.2%. Newton didn’t play well, but his offensive line did almost nothing in terms of protecting him. And it’s not that Newton wasn’t mobile. He ran for 43 yards, doing a lot better on his feet when moving away from the pocket compared to previous game. It’s probably not the injury anymore. It’s his throwing, his accuracy and the bad protection he’s getting. Nine of his passes were overthrown and was only 2-of-10 for 18 yards when targeting Benjamin. He was only 1-of-7 for 47 yards when the ball traveled more than 15 feet in the air. Brees got a lot of help from Mark Ingram, who ran for 100 yards on 33 carries. The Saints have gone in recent years with a committee approach but at the moment, it looks like they’re changing direction towards the workhorse approach, as Ingram, having a slow start to his NFL career after coming in as the Heisman trophy winner from Alabama, rushed for 272 yards over the last two games and is becoming more than a short-yardage threat. Both teams turned the ball over twice, but the Panthers simply couldn’t get anything going on offense. The running game for Carolina was sufficient at 109 yards on 23 carries, but when the passing game isn’t just struggling but actually damaging on almost every snap, it’s very hard to put up points and winning is out of the question, as the Panthers defense isn’t as good as it was last season, struggling to provide consecutive solid performances. The Saints are now 4-4, winning on the road for the first time this season, and taking the lead in the very bad NFC South. Brees has had problems with his Jimmy Graham connection to start the season, but he completed 7-of-7 throws when targeting Graham, resulting in 83 yards and a touchdown. He was also sacked four times, but you won’t find the same inaccuracy rating with Brees tossing the ball. Even on the road, he’s much better than a dysfunctional Newton.